This custom home is located in the heights of a new district up town beside the lake with private streets, ontop of the olive-tree hill. It was one of few homes featured at the 2015 Home Tour, for its fine architectural design. 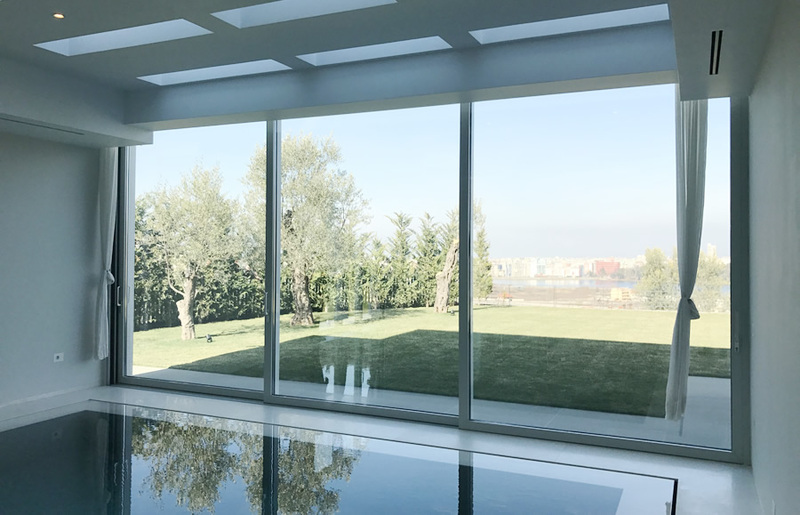 Apollon Windows & Doors tailor-made these slim profile Lift and Slide Doors for this design project to achieve a connection of the indoor swimming pool with the outdoor courtyard, making this way an ample seamles living space. With the best thermal performance of its typology, with the S700 series we can have the best division of this two environments in different weather conditions as the seamles connection of the grass and water surfaces here, offered by its low frame guide. The Architect used the almost invisible Apollon glass balustrade to show only the elegance of the hovering first floor. And ontop, the architect uses Apollon Carbon pivot door on a glass wall to give an immediate surreal impression of the robust standing in elegance.